We are having a provincial election today in Ontario and I'm hoping people get out and vote. In the last election only 49% of Ontarians voted. It doesn't seem like democracy to me when only half the people have a say. If you are in Ontario, get out and vote! There are changes that need to be made to the electoral system (see: Fair Vote Canada), but until they are made this is the system we have to work with. Vote anyway! Even if you think your vote doesn't count. Also, if you are able to take someone with you when you vote, do it! I'm taking John's Grandma with me to the poll. When the election is over, I have to say I will not miss all the campaign signs in public spaces. I understand and accept the political expression, and always love to see a house with a lawn sign (there are only two houses with a sign on my entire road). However I can't help but call the signs along the roadway an eyesore. This stretch of the bike trail (right) has 17 campaign signs. In a row. For only four different parties. It gets to be a little much. If you are in Ontario - VOTE! Polls are open from 9am-9pm. If you need information about your polling station, check out the Elections Ontario website. The website may require you to provide an exact address for the information you need. It could be that the address they have for you is different than your actual address. Fun, right? If you run into trouble, just give them a call at 1-888-668-8683. I wonder if people even see, really see the signs anymore. I don't like them, all messy and on the lawns and sides of roads. Have a great day. I can't imagine 17 signs in a row encourages anyone to make an informed choice about who to vote for. I'm sure there are the same number every time, but this year there just seemed to be sooooo many. 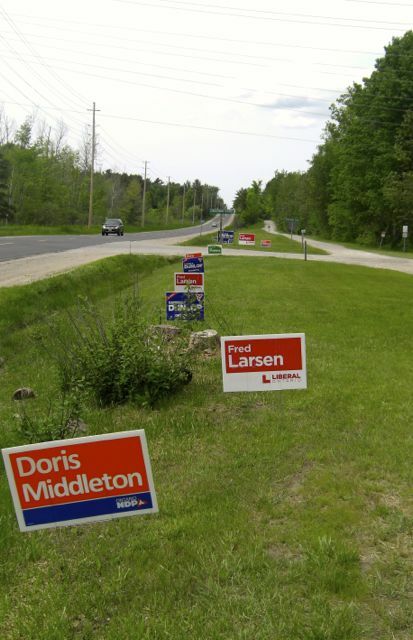 My riding has all the same candidates as last time, so they probably had a lot of signs leftover and also made new ones. A sign on someone's lawn doesn't bother me, but all the ones along the roadway do look messy. I'll teleport some over, straight away. I made brownies in the machine. Though next time I'll bake then in the Easy Bake Oven, because it might work better in that. But I do have bananas rotting, just waiting to be baked in the Babycakes machine. Yeah, it looks messy. I don't mind a sign here or there in a yard, but all along the road, ick. Horrible mess. Oh man - how good would life be if we had teleporters?? geez, sounds and looks like here in USA. you see all these signs but no people. which is good anyways. i dont want to see a bunch of lying stinking politicians anyway. cheers! !